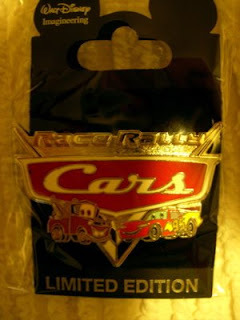 This is a pin from Walt Disney Imagineering, depicting the "Cars Race Rally" future attraction, which will be built at Disney's California Adventure Theme Park in Anaheim, California at the Disneyland Resort. This is a limited edition pin, and will someday be worth lots of money to top Disney pin collectors. I hope that I'll be able to hang with them by maintaining my ownership of pretty babies like this one!